These are the vegetables that are added, to taste, to a bowl of Chiang Mai-Style Curry Noodles (Kao Soi) – as little or as much as you'd like. 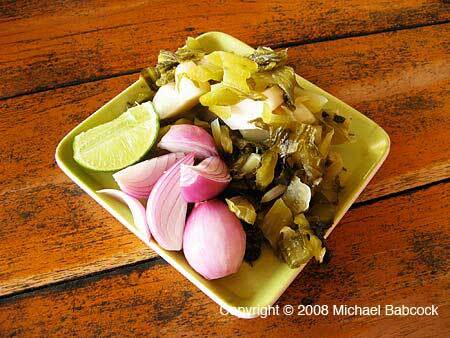 In addition to the shallots and pickled cabbage above, you would squeeze the lime onto the dish for sour flavor and add a good dollop of dried chilli flakes fried in oil. Kasma teaches Kao Soi in Series Set B (class 1).